The gentle, but fun-loving Irish Setter is a favourite among many people and one of the most easily-recognised breeds. The deep mahogany coat is silky and profusely feathered, while the slender build lends an air of great refinement and dignity. Originally bred for hunting, Irish Setters work well in the field as Gundogs and they are happiest when they have a job to do, whether setting and flushing birds or going through their routines in the obedience or show ring. The Irish Setter's gentle disposition and happy personality make him an outstanding companion and family pet. Irish Wolfhounds carry with them a rich heritage that dates to the period of the ancient Celts. Prized, usually in pairs, as essential companions in Royal households, these large hunting hounds were rough or smooth-coated, but the rough coat probably prevailed to protect them from the icy Irish weather. With the disappearance of the wolf in the 17th century, the Irish Wolfhound lost popularity and it was only in the late 1800s that the breed was re-established. These Gentle Giants are placid and generally sweet-natured. They are striking in their size and appearance and, standing on their hind legs with their paws on your shoulder, can easily reach a height of 2.1m. The Kerry Blue Terrier was developed during the 1700s in the mountainous regions of County Kerry from which its name is derived. It is considered the National Terrier of Ireland - also known as the Irish Blue Terrier. The Kerry Blue is a medium-sized, muscular dog with a feisty Terrier style and character. He is determined and spirited, loyal to friends and family but formidable to strangers and intruders. The Kerry Blue is born totally black and develops a dark blue, deep slate colour as he matures. The Kerry Blue sheds little or no hair and is odourless, even when wet. Frequent bathing will not dry out the skin as it does in so many other breeds and regular bathing and grooming is essential. 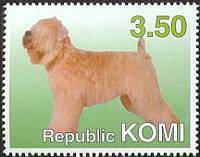 The Irish Terrier, which looks partly like an Airedale and partly like a Wire-haired Fox Terrier, is one of the oldest of the Terrier breeds. He is sturdy and strong, showing good substance in bone and muscle. He has distinctive, bushy eyebrows and a reddish-coloured coat, characteristic of the Celtic look. Typically Terrier, he is courageous and active, sometimes feisty, and a bit of a daredevil. He is devoted to his family and friends and keenly affectionate. He makes an ideal and playful children's companion and loyal family member. The Irish Water Spaniel is the largest of the Spaniels and, as his name implies, was developed to retrieve game from the water. These dogs love to swim and their slightly webbed feet and dense coat aid them in this activity. 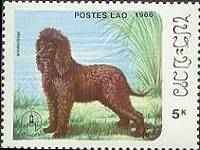 Possibly descended from the Poodle, his waterproof coat is crisp-textured and densely curly - brown, almost purple. His tail, is completely hairless and ratlike. He is an eager, bold and confident dog, somewhat stubborn and independent, but intelligent and relatively easy to train. The Soft-coated Wheaten Terrier's origin is firmly rooted in Irish soil. He was originally bred as a working dog to hunt game and guard the home but is, nowadays, quite content to live it up as the family pet. His coat is soft and sheds infrequently, making it a suitable breed for allergic family members. He is a medium-sized, compact dog - strong and graceful in movement. He is an alert dog that can play the role of watch dog, barking to alert the arrival of strangers. He is sweet-tempered, easy-going and bold and makes a loyal, affectionate family companion. More ancient than the Irish Setter but not as well known is the Irish Red and White Setter, from which the Irish Setter has its origins. Although he makes an ideal home companion, he was bred primarily for the field, thus he has a balanced, athletic appearance. He is a friendly dog, showing intelligence and an eagerness to learn. At home, he is a somewhat loveable clown and not a stranger to mischief.